My New 30: The Countdown to SPRING is ON! The past 3 days that it has been gloomy and raining, my neighbors must've thought I was crazy as they drove by our house and saw this very large blue sheet covering a large shrub in my front flower bed. That, is my azalea bush. And azaleas are a funny lot. They bloom very early in the spring and are one of the first shrubs to bring out color. But, while the shrub itself remains evergreen all year round, the beautiful flowers it produces are very short lived and when you have a series of them in your landscaping, it is truly a beautiful sight! Now, sadly the one pictured above is my one remaining older azalea that survived the salt water intrusion from Hurricane Katrina when the Gulf of Mexico turned everything inland for a few miles into a temporary salt water pool. I've since planted a few more to replace all the ones that died, but they are all young, and well that one, well, that one is kinda special - it pulled through and didn't die on me! Well last week it was simply beautiful here - but as the bad weather began to roll in here this past Friday, and we were told it would be several days of some fairly hard rain, my azalea was fully loaded with buds and just beginning to bloom out! And rain is especially hard on azalea blooms. It flattens the flowers, knocks most of them off, and can literally strip an entire shrub of every bloom in one good hard rainstorm! So ... I covered it with a sheet for all three of those rain drenched days and nights. And when the rain was finished as of yesterday, I uncovered it to find these beautiful blooms. Had I not covered it, these would have been lost. And I would have missed their temporary and short burst of beauty. Now... on to the veggies! If you're not familiar with the square foot method basically it is done in a raised bed that is divided into grids. Mel says, "without a grid, your garden is not a Square Foot Garden." A 4 x 4 SFG would have 16 squares. 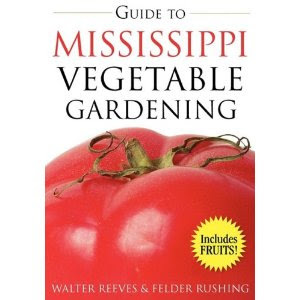 Depending on what you are growing, there may be one plant in a single square - like bell peppers and vine tomatoes, or one plant that takes up multiple squares as with summer squash, bush tomatoes or melons, or there could be multiple plants in a single square, as with carrots, beans and radishes. I initially wanted to do 4 beds that were 4 x 4 each, but I settled on starting with 2 instead and see how it goes first! So today we picked up the lumber - four 8 foot, 2 x 8s, which we had very quickly cut in half to 4 feet long right there in Lowe's lumber department. Mel recommends a minimum of 2 x 6s, but I went ahead with the 8 and may just layer some sand in the bottom instead of filling all 8 inches with soil mixture. He claims that we only need 6 inches of soil in our boxes! Now of course you can frugal this and use "found" wood if you can hunt some down from a construction site, but we dished the cash out for these pretty pine pieces. Don't forget - avoid the treated wood because if it does get damaged it will leech those chemicals into the soil and well, especially for veggies you sure don't want that! Stick with cedar, pine, fir, even redwood (if you can swing the cost), just not treated lumber. For the slats on top that make up the grid outline, I picked up some cheap wood lath pieces (found over by the lattice work) to use as my grid markers. If you can find a thrift shop set of old mini blinds that fit into a large window, those would work too. Once the garden boxes are set, and the grids in place, we'll be doing an easy vertical frame, but that's later. We also picked up some deck screws we'll be using to secure the wood pieces together. For the soil, I wanted to try to follow Mel's mix, which is 1/3 peat moss, 1/3 vermiculite and 1/3 blended compost from 5 separate sources. Essentially what he means is that he wants us to combine 5 different forms of compost, from your compost pile, from different types of manure, humus, mushroom compost, worm castings, soil mixes and boosters and such. Lowe's didn't have much variety on the compost, and no vermiculite, but I found this Jungle Growth brand of flower & veggie soil mix that contains forest compost, sphagnum peat moss, perlite, vermiculite, horticulture grade hardwood charcoal, lime and 1:1:1 fertilizer. And of course, we picked up some peat moss, humus, and some good old Black Kow cow manure! Now I did not calculate how much cubic feet this would come to because that would involve math and though I so love math (not) I just had no interest in tryin' to go figure all that out. So, I have no idea if what we bought will be enough (likely not), but we had the tonneau cover on the truck and well, this is just about all we could fit in there, so we'll be making another run here shortly I'm sure. And of course, there's the seeds some of which I have already from prior seasons that I haven't even pulled out yet, and some new, fresh ones I picked up recently. Most are sown directly into the ground, but I'm sure there are a few I coulda got a head start on - ooops! And of course a few veggie seedlings. And a couple of marigolds. Hey Shaylynn! Yeah, I only have one good spot in my yard that gets enough sun, so I had to do the same thing when I was trying to figure out where to put a veggie garden. While you certainly could go 24" inches high that would require an awful lot of dirt (and money). A lot of elderly folks like them that high so that there isn't any bending involved. Much easier on the back! Also great if you're wheelchair bound. In the SFG book he swears you only need 6 inches of soil, and I guess that's possible since I've seen tomatoes grown in flat soil bags! Anyway, for sure I'll be blogging about my adventure! Sunday's dinner included canned home grown green beans and homegrown corn from the freezer. It is such a great feelin' during the winter months to pull out food you've grown and preserved yourself. And it's too easy, really. Hey Rebel! Lucky you with the corn!!! My biggest problem down here is blight and BUGS. Those darned beetles ate everything up last year, what the blight didn't ruin that is. It's not the raised bed that guy was saying would not work well down here, but the square foot gardening method. 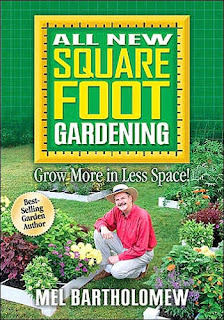 Square foot gardening uses grids of 16 squares within a 4 x 4 bed and so you have a lot of stuff going on within all of those squares and your plantings are very compact to make use of the small space. He thinks that means overcrowded beds that don't provide enough circulation which creates problems in our high humidity. The key I think is gonna be not to overfill the squares in any one bed, but to use some plants that are only 1 plant per square, or even like summer squash that take several squares. We'll see I guess! I'm gonna try to plant some corn along the side of my privacy fence this year. Not sure if there will be enough sun there, but thought I'd give it a try. Maybe even in my flower bed that is southern facing, who knows! Thought I'd throw out some seeds and see what happens. If I can keep the squirrels away from them that is!! I was at home depot yesterday, drooling over the gardening things. . .I've never really had a garden, and I have BIG plans for this year! I can't wait to see how your SFG turns out. My friend uses that method and loves it. I can't even plant for another few weeks, we haven't even broken 70 yet. . .
Oh Krystal, I'm so excited that you are going to give it a go this year! There's nothin' like fresh veggies from right out of your own garden. Hubs and I spent the day raking today so we'll hopefully get to the boxes tomorrow. I was considering another site so I laid them out today and watched the sun, but that area isn't getting enough sun so they'll have to go back to the original spot, which means I have to weed it first. Be sure to check the post I did here http://mynew30.blogspot.com/2009/03/vegetable-gardening-workshop-1-msu.html from the workshop I attended for some good tips! Thanks Joyce - gotta watch it early though LOL... once the heat hits real good here, everything goes to pot.